Bot Thoughts: How do you organize your cables? How do you organize your cables? I don't and am soliciting your wise advice. Here's my mess of cables. How do you organize yours? What containers, retainers, thingamajigs do you use to maintain order? It's the cables nature to be a mess. Don't try to fix it, it won't work. It must be the digital guy in me, but I have this insatiable need to reduce the space taken up by things that I keep around. I'm not an extreme minimalist, as I enjoy functions that aren't quite a necessity. 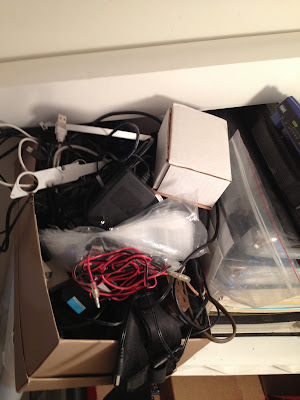 I'm not a hoarder, as I would probably dump the junk I'll not use. I try to be practical in keeping my tools and supplies. If I know it's there, and it's easy to reach, then I'm much more likely to use it. If it's there and I'm not likely to use it, then it needs to go or be archived somehow. If it's there and I don't know it, nor can I get to it easily, then it's useless; no matter how much money it's worth. So I seek to increase the utility of what I do keep around so as to make the things I do keep 'worth' so much more. 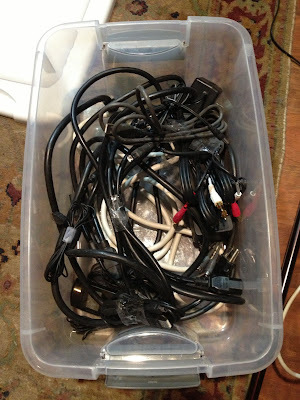 Also useful for smaller wire organization are the wire twist ties that come with garbage bags. Keys to thingamagig organization: labeled, uniform, stackable boxes. Boxes that can't be closed because they have stuff overflowing, are boxes that can't be stacked. The boxes don't have to be expensive, simple cardboard boxes of fairly uniform dimension work great. Leftover paper boxes, diaper boxes, etc. all work great. A permanent marker marked on the top and one side with a label works to keep order and help me find stuff fast. The label only has to be basic, maybe one word, or even just one letter to describe what's in the box. W for wire, T for transformers, L for Lego, PC for computer stuff, A for atomic reactor equipment, etc. I hope you enjoyed my work-avoiding ramble. Now back to the grind! I use freezer size ziplock bags I get at CostCo. Roll em up, lasso style, and stick 'em in the bag. If needed, write a description on the bag with a marker. 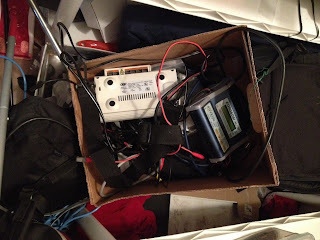 Easy to see what you got and easy to store in a box with nothing getting tangled.